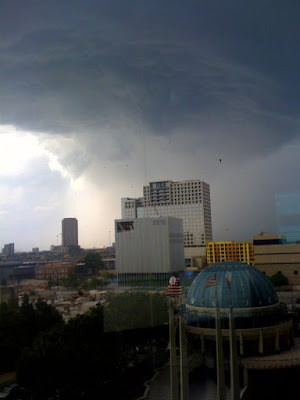 Looks like we have a summer storm brewing! 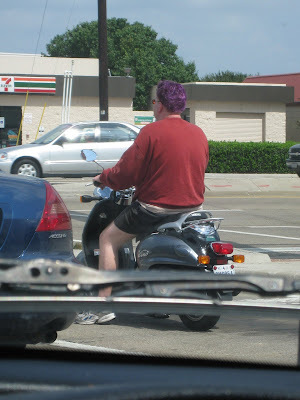 so far the only person that classes up a scooter is Aunt Janae - remember ? I have found a new awesome series. A friend loaned me "City of Bones" by Cassandra Clarke like 6 months ago. I put it aside as a "book I will read when I have nothing else to read". So, I picked it up this weekend, and when I saw that the main character was 15 years old, I almost put it down (just like I almost did with "Twilight") - but once I started reading it - LOVED IT... just like "Twilight". 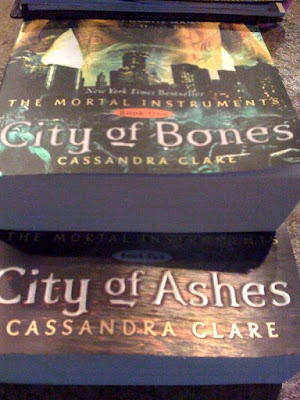 I couldn't wait to get the next book "City of Ashes". I looked at Half Price Books first, but they didn't have it. I felt a little weird looking in the young adults section, but oh well. I found it at Borders - in the young adult section. I almost picked up the third book "City of Glass" but it was hardback ($$), and I figured that was too much to spend on books - because we all know that I didn't leave Half Price Books empty handed!